What happened to November? My Mother passed away, and I did not have time to organize Novembers Southern Sky Watch. 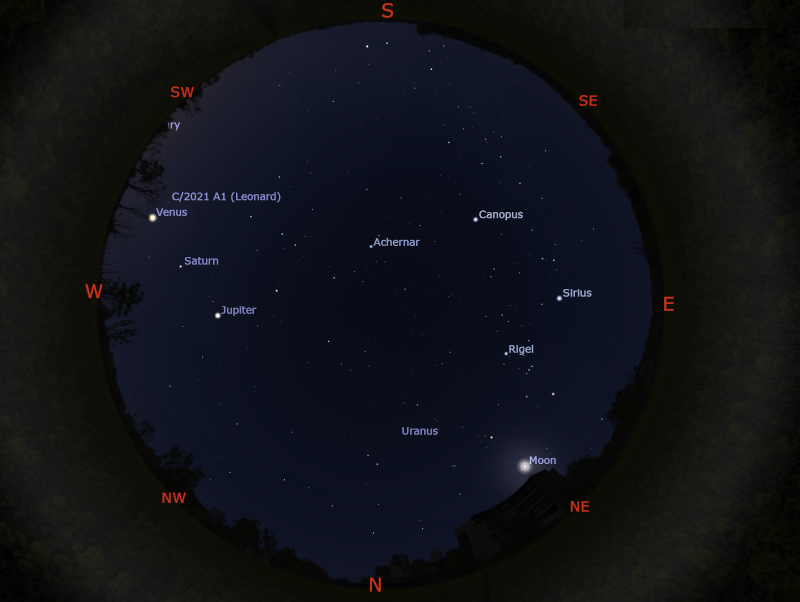 This month the planetary action is divided between the evening skies and morning skies. Venus bright in the east with Mercury below it. Saturn and Mars grace the western evening sky. Mercury and Jupiter close. Variable star Mira bright, comet 46P potentially visible to the unaided eye. Geminind meteor shower. Useful info for visitors from New Zealand, South Africa and South America. December; Comet 46P potentially visible to the unaided eye, variable star Mira bright. December 4; Venus and the crescent Moon close in the morning. December 9; crescent Moon close to Saturn. December 12; Moon at Apogee. December 13-21 Comet 46P bright(ish). December 15; Mars close to the first quarter Moon. December 22; Jupiter and Mercury close. December 24; Moon at perigee. Looking up at the stars is still a rewarding pursuit, despite the increasing light pollution in our major cities. The southern sky is full of interesting objects, many of which go unseen in the northern hemisphere. All you need for a good nights viewing is yourself, a good idea of where south and east are, and your hands. Optional extras are a small pair of binoculars, a torch with red cellophane taped over the business end and a note book. A great many tips for backyard astronomy may be found here, although many of them are more relevant to the northern hemisphere. A general article on amateur astronomy from New Scientist is here (may require subscription otherwise see the TASS site.). This page is designed to give people a simple guide to the unaided eye sky. In the descriptions of planet and star positions, distances in the sky are given as "fingers width" and "hand span". This is the width of your hand (with all the fingers together as in making a "stop" sign, not bunched as a fist) or finger when extended a full arms length from you. Summer is here once more, and the beautiful constellations of Orion, Taurus and the magnificent rambling constellations of Carina, Puppis and Vela grace our skies again. The December school holidays will be an ideal time to head out somewhere dark and view the stars and planets at their best. Summer also means very long twilights in southern Australia, so you may have to wait to see these delights. Despite the warmth of the days, nights are often cool, so don't forget a light jumper before doing any extended star watching. A blanket or rug to sit on is a good idea. Some mosquito repellent will be a must. While these pages are primarily intended for the use of people observing in Australia, non-Australian Southern Hemisphere observers will find most of the information here applies to them. The star information will be most helpful, when you correct your location for latitude (see the Stars section for appropriate location information). Most Moon phase, planet, comet and asteroid information will be very similar to what will be seen in New Zealand, South Africa and South America. Countries close to the equator (eg Indonesia) will have somewhat different southern and northern views, but the eastern and western views should be similar enough to get a good idea of what is going on. Occultations, eclipses and aurora are highly location dependent, and it would be best to get a local almanac for these events. If there is no local almanac available, email me and I might be able to help you. I do try and give general info for occultations and eclipses in the Oceania area of the Southern Hemisphere. Aurora Alert UPDATED 28/08/18: Despite solar maximum having passed, we are still getting occasional good auroral displays. August 26th 2018 saw an impressive display visible from NZ and Tasmania despite the full Moon. The last week of March 2017 saw some impressive aurora displays from Tasmania, Victoria, SA and WA. September 2016 saw a series of good but transient aurora in Tasmania and southern Victoria. July 2015 saw a massive storm seen as far north as mid NSW, again clouded out for large parts of Australia. 17-19/3/2015, the St. Patrick's Day aurora, massive storm seen as far north as Southern Queensland. Unfortunately clouded out for large parts of Australia. 26/2/2015, yet another good set of aurora were seen from Tasmania. 9/2/2015 There was a series of very good auroral events during January, some were seen in NSW, Victoria, SA and WA as well as Tasmania. Last year saw some nice events and a coronal mass ejection from an M class flare hit us square on on March 17 2013. Aurora were detected as far north as the QLD border, with some really nice events in Tasmania, and here are some images from that event. The Sun is now at solar maximum, but has been rather quite so far apart from the odd event like the 17 March 2013 one and the 22 February 2014 and the January 2015 events (and of course the St. Patrick's Day Storm). Although we should be exiting solar maximum in 2016 we may see more aurora in the near future. Auroral images and descriptions from past geomagnetic storms are now at the auroral image web page. We are now at the tail end of solar maximum in 2016, and we can expect to see a reducing frequency of aurora. There have been some good displays in Tasmania recently (the St. Patrick's Day storm was a beauty, see as far north as NSW). Tasmania, King Island and Southern Victoria are the most likely places to see aurora. However, on September 24, 2005 there was a massive auroral storm seen as far as northern NSW (and the 22 February 2014 one was seen as far north as southern NSW). Naturally, the best views of any aurora will be away from the city and bright lights. Aurora occur when charged particles from the solar wind enter Earths outer atmosphere and interact with the oxygen and nitrogen atoms producing eerie displays of coloured lights. During solar maximum, which occurs every 11 years, the number and speed of the particles are higher, allowing them to penetrate the Earth's magnetic field at lower latitudes than normal. Observers in Tasmania are likely to see green glows or sheets of light in the southern sky. Observers in Southern Victoria are more likely to see a red glow in the southern sky, although more spectacular displays are possible. The Astronomical Society of Tasmania has a webpage devoted to this phenomenon. The Australian IPS radio and space services covers Aurora and related phenomena in very great detail (too much if you don't know much about them) but has a nice education page. Flinders Uni also has real time magnetometer readings, however, this will probably not mean much to most people. Aurora will generally follow solar flares by about 2 days, and a number of instruments are watching the sun for these outbursts. The solar minimum occurred in 2006 and persisted for some time. While sunspot numbers, and hence flare rates are increasing, sometimes months will go by without an alert, then you have three in a week. The space weather site at http://www.spaceweather.com gives notice of when solar winds likely to cause aurora will arrive. Alternatively, send an email to reynella@mira.net with "subscribe aurora alert" as the subject and I will send you an email alert of any likely auroral event (or other interesting sky phenomena). However, even a strong solar flare is no guarantee that you will be able to see aurora, but it does increase the probability. Still more alternatively, there are the facebook pages Aurora Australis Tasmania, Aurora Australis Tasmania NOW! and Aurora Australis all do discussions and alerts. Email alerts I try to update this page fairly regularly outside of the monthly postings. However sometimes things happen which I can't get in fast enough, or you forget to mark your calendar. If you would like to be alerted to or reminded of interesting astronomical or sky phenomena, send an email to reynella@internode.on.net with "subscribe aurora alert" as the subject. This is the old aurora alert list, but with auroras rare even though we are at solar maximum (except for the occasional humdinger, like the September 2005 auroral event), it is doing double duty. Astroblog will have images when possible of these events soon after. 7 January 2018; Mars and Jupiter closest at 0.25 degrees. 4 May 2018; Moon close to Saturn. 6 May 2018; Moon close to Mars. 6 May 2018; Eta Aquariid meteor shower. 9 May 2018; Jupiter at opposition. 14-15 May 2018; Mars less than half a finger-width from globular cluster M75. 17-18 May 2018; crescent Moon close to Venus. 21 May 2018; Venus close to M35. 27 May 2018; Moon close to Jupiter. 1 June 2018; Moon and Saturn close. 3 June 2018; Moon and Mars close. 16 June 2018; Crescent Moon near Venus. 19 June 2018; Asteroid Vesta at opposition, potentially visible with the unaided eye. 20 June 2018; Venus in the Beehive cluster. 21 June 2018; crescent Moon and Venus close. 23 June 2018; Moon and Jupiter close. 27 June 2018; Saturn at opposition. 28 June 2018; Saturn close to the Moon. 1 July 2018; Mars and Moon close. 4 July 2018; Mercury close to Beehive cluster. 13 July 2018; Partial Eclipse of the sun, visible only southern SA and VIC. 15 July 2018; thin crescent Moon and Mercury close in the twilight. 16 July 2018; crescent Moon and Venus close. 21 July 2018; Moon and Jupiter close. 25 July 2018; Moon and Saturn close. 27 July 2018; Mars at Opposition, the best since 2003. 28 July 2018; Total Lunar Eclipse, early morning. 30 July 2018; Southern Delta Aquarids meteor shower. 14 August 2018; Crescent Moon close to Venus. 17 August 2018; Moon close to Jupiter. 21 August 2018; Moon close to Saturn. 30 August 2018; Saturn close to Triffid Nebula. 1-2 September 2018; Venus and Spica close. 12-13 September 2018; Crescent Moon close to Venus. 14 September 2018; crescent Moon close to Jupiter. 18 September 2018; Moon close to Saturn. 20 September 2018; Moon and Mars close. 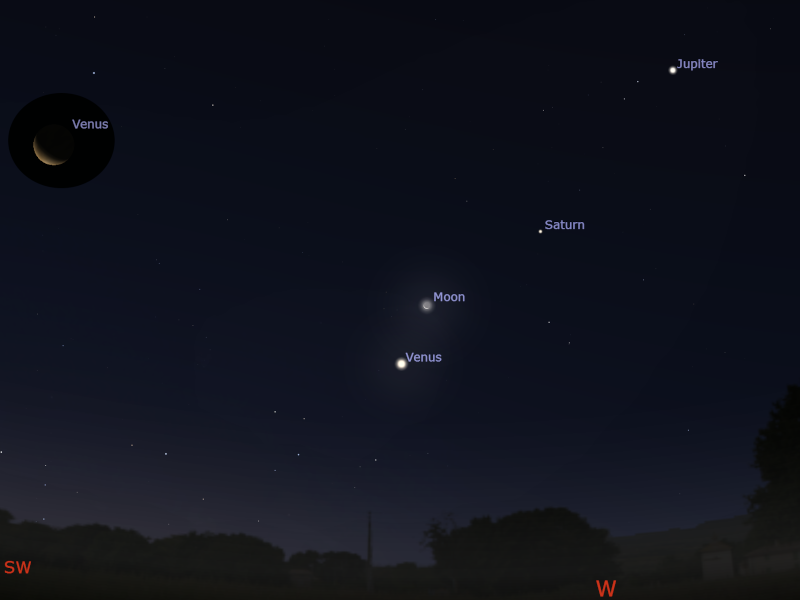 10-20 October 2018; All 5 five bright planets visible in early evening sky. 10 October 2018; Mercury and Crescent Moon close. 12 October 2018; crescent Moon close to Jupiter. 15 October 2018; Moon close to Saturn. 16 October 2018; Venus and Mercury close. 18 October 2018; Moon close to Mars. 22 October 2018; Orionid meteor shower. 28 October 2018; Mercury and Jupiter close. 9 November 2018; Jupiter crescent Moon close. 11 November 2018; Crescent Moon and Saturn close. 16 November 2018; Moon close to Mars. 17 November 2018; Leonid Meteor Shower. 1-20 December 2018; Comet 46P potentially visible to the unaided eye. 4 December 2018; Crescent Moon close to Venus in morning twilight. 9 December 2018; Crescent Moon close to Saturn in evening twilight. 15 December 2018; Geminid Meteor shower. 14-15 December 2018; Moon close to Mars. 22 December 2018; Jupiter and Mercury very close in dawn sky. Mars Curiosity Rover tries to drill red rocks. Mars Express sees the processes that shape the surface of Mars. The Mars Reconnaissance Orbiter sees Opportunity to emerge from the dust storm. The Juno mission detects train waves in Jupiter's atmosphere. more exciting images from an Asteroid. December 4; Venus and the crescent Moon close in the morning. December 9; crescent Moon close to Saturn. December 12; Moon at Apogee. December 15; Mars close to the first quarter Moon. December 24; Moon at perigee. An interactive calendar of the Moon's phases. A view of the phase of the Moon for any date from 1800 A.D. to 2199, US based, so that the Moon is upside down with respect to us. The image above is from this source. The phases of the Moon have been linked in the popular imagination to activities as diverse as madness and menstruation. However, careful study has shown that there are no such links. This web page outlines how the Moon is unconnected with a wide range of human activities. Finding planets, even with the directions below, can sometimes be difficult if you are unfamiliar with the sky. However, the Moon is very obvious, and can be a guide to location of planets. Not only that, the combination of the Moon and bright planet(s) is often very beautiful. Thus the guide below gives the dates when the planets and the Moon are close together. The morning sky on Tuesday December 4 facing east as seen from Adelaide at 4:50 ACDST 60 minutes before sunrise, Venus and the crescent Moon are close. (The inset shows the telescopic view of Venus at this time, similar views will be seen Australia wide 60 minutes minutes before sunrise). 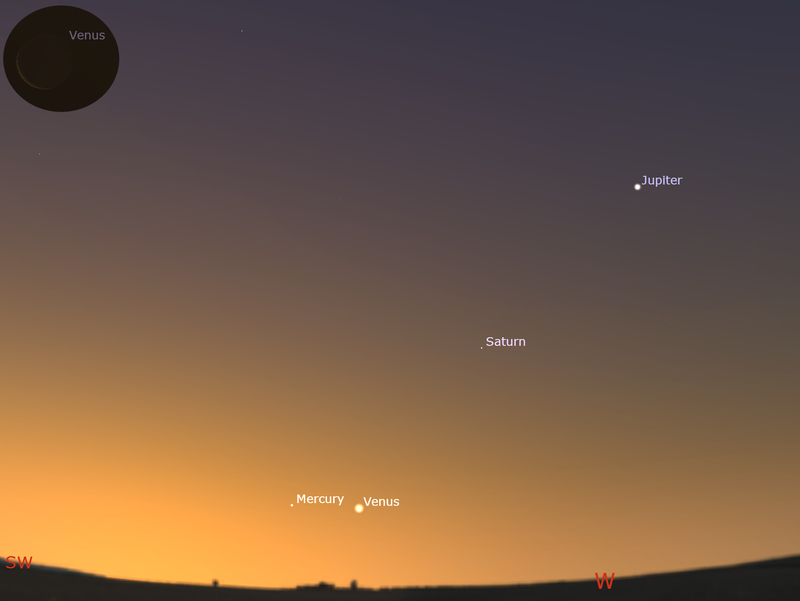 The evening sky facing west on Saturday December 15 facing west as seen from Adelaide at 21:32 ACDST 60 minutes after sunset, the last quarte Moon is close to Mars and Saturn has just set. (similar views will be seen Australia wide 60 minutes minutes after sunset). The morning sky facing east in Adelaide on December 22 at 5:29 ACDST 30 minutes before sunrise. Jupiter and Mercury are close with Venus above. (similar views will be seen from other cities at the equivalent local time 30 minutes before sunrise). Mercury returns to the morning sky mid-month and is close to Jupiter at the end of the month. December 15, Mercury is just over a hand-span above the eastern horizon half an hour before sunrise. On December 22 Mercury and Jupiter are just under a hand-span apart. On December 30, Mercury is just over a hand-span above the eastern horizon half an hour before sunrise. 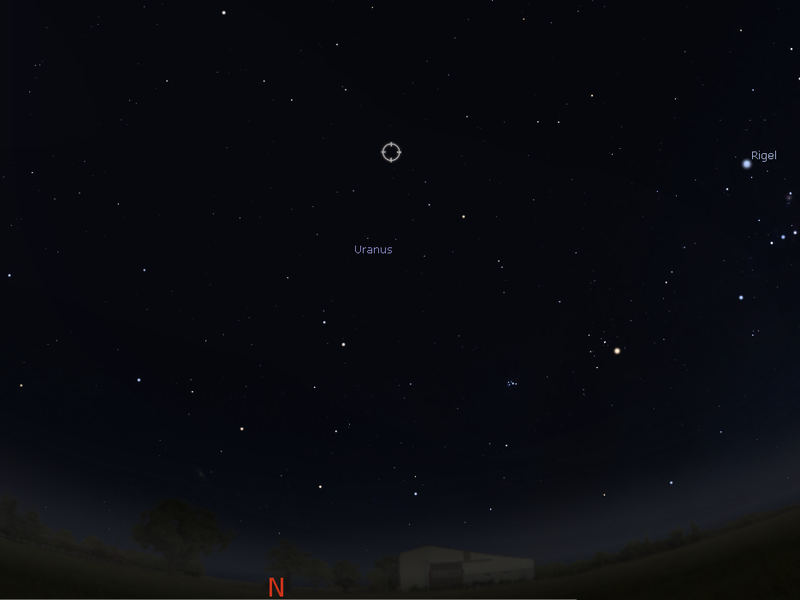 Venus climbs higher the morning sky this month. Venus is a distinct very thin "crescent Moon" shape in telescopes at the beginning of the month and waxes to "half Moon" shape. On December 1 Venus is just under two hand-spans above the eastern horizon an hour before sunrise. On December 4, crescent Venus and the thin crescent Moon are a hand-span apart. On December 15, Venus is just over two hand-spans above the eastern horizon an hour before sunrise. By December 30, Venus is just over three hand-spans above the eastern horizon an hour before sunrise. Earth is at solstice on Saturday the 22nd, when the day is longest. Mars was at opposition on July 27, when it was biggest and brightest as seen from Earth, but while substantially dimming and shrinking Mars remains bright but is a challenging telescope observation this month. Even small telescopes may reveal the polar cap and the "gibbous Moon" shape of Mars. Watching Mars over the the month in a telescope you should see Mars visibly decrease in size. Mars spends most of the time in Aquarius this month before moving into Pisces. On December 1 Mars is just above 8 hand-spans above the north-western horizon an hour and a half after sunset. On the 7th Mars and Neptune will be incredibly close at 4 arc minutes, and visible together in high power telescope eyepieces. On December 15 Mars is 6 hand-spans above the western horizon at hour and a half after sunset, and is a hand-span from the First Quarter Moon. On the 30th Mars is just above 5 hand-spans above the western horizon an hour and a half after sunset. Jupiter, enters the Morning sky late this month, and come close to Mercury towards the end of the Month. Jupiter is in Scorpius at the start of the month then moves into Ophiuchus. On December 15, Jupiter is just under a hand-span above the eastern horizon half an hour before sunrise. On December 22, Jupiter and Mercury are less than a finger-width apart. By December 30, Jupiter is nearly a hand-span above the eastern horizon an hour before sunrise. In either binoculars or a telescope Jupiter's Moons are always interesting. Times are AEST, subtract 30 minutes for ACST and 3 hours for AWST. Add one hour for Daylight Saving time. Saturn is now low in the evening twilight and is lost to view by the end of the month. On December 1 Saturn is nearly two hand-spans above the western horizon 90 minutes after sunset. On the 9th the thin crescent Moon will be close to Saturn, you may need binoculars to see them in the twilight. On the 15th Saturn is just over a hand-span above the western horizon 30 minutes after sunset. On December 15 the waxing Moon is three finger-widths from Saturn. On the 30th Saturn is lost in the twilight. See this amazing site for images of the space station taken through a telescope. The Iridium satellites are being deorbited, so this is the last year you will have a chance to see these flares. Iridium flares add a bit of spectacle to the night sky. The Iridium satellite network was set up to give global phone coverage, so an Iridium satellite is almost always over head. Occasionally, one of the antenna of the satellites is aligned so that it reflects the sun towards an observer, giving a brilliant flare, often out-shining Venus. However, the visibility of Iridium flares is VERY dependent on observer position, so you need a prediction for your spot within about 30 km. Hence I'm referring you to a web site for predictions rather than doing it myself. Heavens above, an excellent site. You need to choose your location or manually enter a longitude and latitude (once done the site remembers this). Predicts Iridium Flare occurrence, and gives the visibility the space shuttle, the International space station and heaps of other satellites. I find this the most useful site. Or type in Your Latitude and Longitude in decimal format eg Darwin is -12.461 130.840 , to find your Lat Long go to this site. Another site, JPASS, doesn't do Iridium flares, but is very cool and does the International Space Station, and many other satellites. However, although the output is flashy, it's harder to use than heavens above. The JPASS site from NASA. The figure ZHR is zenithal hourly rate. This is the number of meteors that a single observer would see per hour if the shower's "point of origin", or radiant, were at the zenith and the sky were dark enough for 6.5-magnitude stars to be visible to the naked eye. Illumination gives an idea of how dark the sky is, the sky is darkest at New Moon, and brightest at full Moon, morning meteors will be unaffected by the First Quarter Moon, but will be dimmed by the Last Quarter Moon. The Puppids-Velids are a modest southern meteor shower (roughly a meteor every four minutes) that doesn't require you getting up too late to see, although meteors are always best in the early morning. At midnight, AEDST (11.00 pm AEST) the radiant is 9 hand-spans up from, and 6 hand-spans to the left of, due east. This is roughly a hand-span below and to the left of the False Cross. A spotters map is here. Geminid radiant seen facing north in the southern Hemisphere at 4:00 am daylight saving time, December 15. The Geminids are a fairly reliable meteor shower, with rates of about a meteor per minute at their best. 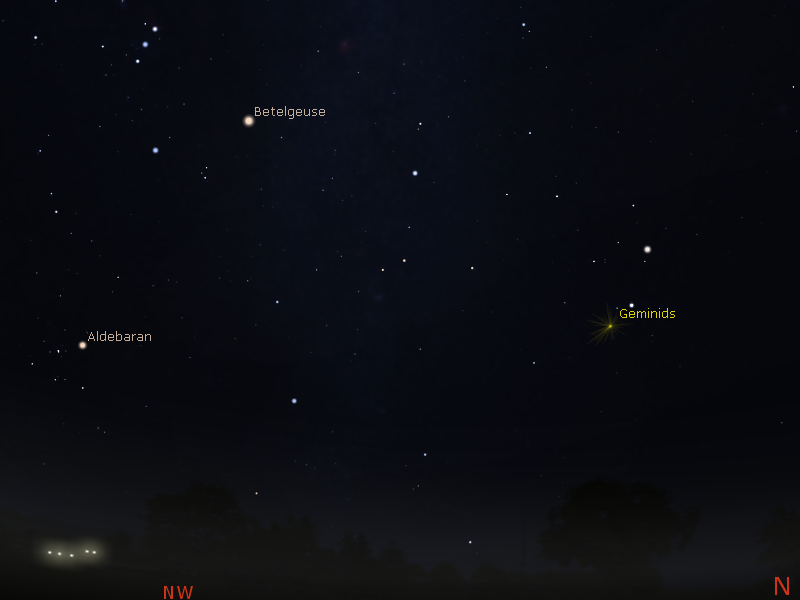 This is a good year for Geminids, as the New moon ensures dark skies. The radiant doesn't rise until just before midnight (daylight saving time) in most of Australia, so you will have to disturb your sleep for this one. At 1.00 am in the morning AEDST (midnight, AEST) Castor (alpha Geminorum) is about two hand-spans above the horizon and 10 hand-spans to the left of due north. Pollux, the other twin, is less than a hand-span to the left again. The radiant is just below Castor. A spotters map is here. Unlike the Leonids, where there is a very narrow peak of high activity, the Geminids have a broad peak and will normally show good activity well before and after the peak, and on the day before and after. Australians should see a meteor every 2-3 minutes under dark skies in the early morning of the 15th, between 2:00 am and 4:00 am. Outside of the showers, you can still see sporadic meteors. Rates seen from the Southern Hemisphere are around 6 random meteors being seen per hour during the late morning hours and 2 per hour during the evening. The evening rates will be reduced during the times around the full Moon due to interference by the Moons light. A good page describing meteor watching is at the Sky Publications site. The Meteor Section of the Astronomical Society of Victoria has some good information on meteor watching too. Learn how to take a meteor shower photograph. A good page on detecting meteors using home made radio-telescopes is here. There are no unaided eye comets visible at the moment. Comet 46P is visible in binoculars and may become visible to the unaided eye in dark sky sites between the 13th and 19th. Comet 46P as seen looking north-east from Adelaide at 22:10 ACDST on Tuesday the 13th of December (90 minutes after sunset), when the comet is closest to the Sun. Similar views will be seen throughout Australia at the equivalent local time (90 minutes after sunset). Comet 46P currently in the constellation Eriadanus but will move rapidly into Taurus. It is visible in binoculars and is currently magnitude 5. It is still a bit uncertain how bright it will get but it should get to between magnitude 4 and possibly as bright as magnitude 3 (about as bright as gamma Crucis, the fifth brightest star in the Southern Cross). The comet will be brightest between December 13 to December 19. It will be closest to the Sun on the 13th, and closest to Earth on the 16th (just after midnight on the 17th of AEDST). However, although potentially bright, its fussy, diffuse nature means it will be difficult to spot with the unaided eye under suburban conditions. Even under dark sky conditions it will be a faint fuzzy smear. Despite breathless statements about it being "as big as the full Moon" the comet is so diffuse you can only see this extended coma with long exposure camera images, not with the eye. --> A list of current comet ephemerides is at the MPC. No interesting naked-eye occultations this month. No significant eclipses this month. Find local sunrise/sunset and twilight times for your city or location (courtesy of Heavens Above). Use either the drop down box for the listed cities, or type in your latitude, longitude and city in the boxes below. Type in Your Latitude and Longitude in decimal format eg -12.461 130.840 , to find your Lat Long go to this site. While most stars seem to shine with a constant brightness, there are some that undergo regular, dramatic change in brightness. The classic variables are Mira and Algol. Algol is currently not visible and Mira is just past maximum and in a good position for easy observation. Mira should be fading after its maximum last month. It is still readily visible to the unaided eye and should remain so to the end of December and well worth following over the coming weeks as it fades. Cetus looking north-west at 10:00 pm AEDST on 15 March, Mira is indicated by the circle. Mira (omicron ceti), a star in the constellation of Cetus the whale, is a long period pulsating red giant and changes brightness from below naked eye visibility to a peak of round magnitude 2 (roughly as bright as beta Crucis in the Southern Cross) in around 330 days. Mira is predicted to peak with maximum of 3.4 around 26 November. Mira may be seen above the north-eastern horizon from Astronomical twilight. Mira is currently visible to the unaided eye and will fade over December. 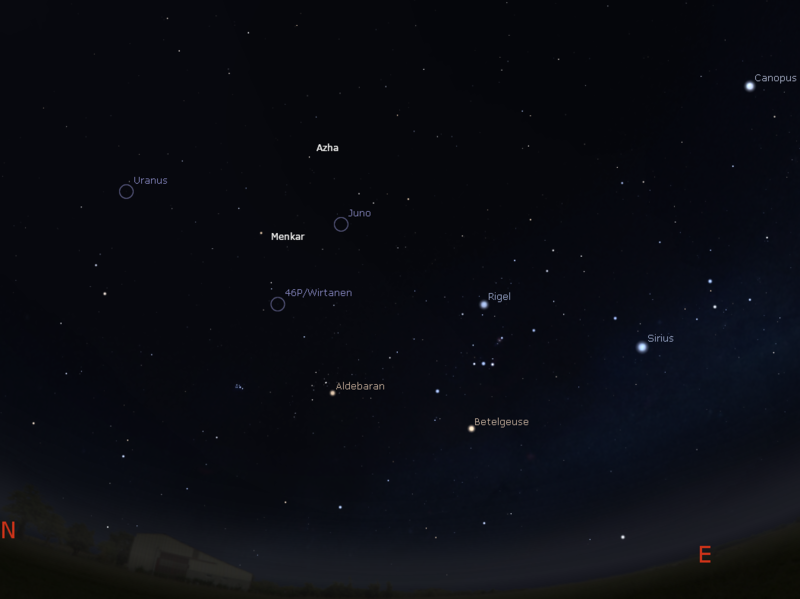 The southern evening sky at 10:00 pm AEST in Melbourne on December 1 (similar views will be seen from other cities at the equivalent local time eg 10:00 pm ACST Adelaide). All descriptions here are based on the view from Melbourne at 10.00 pm AEST (Australian Eastern Standard Time) on 1 December and assumes a fairly level horizon. Starset occurs progressively earlier each day, so these descriptions are valid for 9.00 pm on the 15th and 8.00pm on the 30th. Readers from other time zones should see roughly the same views at 10.00 pm local time. Corrections for cities other than Melbourne are given below. Readers in Adelaide and Auckland should see roughly the same views at the local equivalent of 10.00 pm AEST. Readers in Hobart and Christchurch must decrease descriptions to the North by about five finger widths and increase those to the south by the same amount. Readers in Sydney, Fremantle, Perth, Santiago and Capetown should add 3 finger widths to the northern descriptions, and subtract 3 finger widths to the south. Readers in Brisbane, Alice Springs, Rio deJanerio and Johannesburg must adjust North/South descriptions by two hand spans. Readers in Darwin, Cairns, Brazilia, La Paz, Lusaka and Lima must adjust North/South descriptions by about 4-5 hand spans. How do I find east, west, north and south? Facing east, the faint constellation of Monocerous (the Unicorn) is just on the horizon. At around three hand-spans from the eastern horizon are the constellations of Taurus, the bull, Orion the hunter and Canis major, Orion's hunting dog. Three hands-pans left of due east is the distinctive saucepan shape of Orion's belt. The handle of the saucepan is Orion's sword, which contains some good naked eye open clusters, and the final star in the handle hosts the famous Orion nebula, which is visible to the naked eye under clear skies. Directly above the handle of the saucepan is bright Rigel (beta Orionis). Directly below the saucepan is the bright reddish Betelgeuse (alpha Orinonis), a red giant star. To the left of Orion's belt by about 4 hand-spans is Aldebaran (alpha Tauri), another red giant which forms the base of the V shaped group of stars called the Hyades, which forms the head of Taurus. Further to the left again by about two hand-spans is a faint, but pretty, compact cluster of stars called the Pleiades (the seven sisters, even though eight can be seen on a dark night with good eyesight). The Pleiades are particularly beautiful through binoculars. To the right of Orion's belt by about 4 hand-spans is the bright white star Sirius (alpha Canis Majoris), the brightest star in the sky. 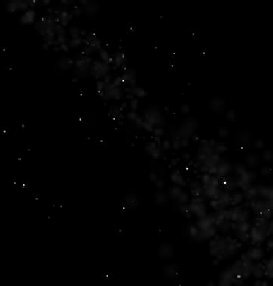 The constellation of Canis Majoris has a number of open clusters that are well worth exploring with binoculars. About 6 hand-spans up from due east is the small constellation of Lepus, the Hare. Above this again, is the faint constellation of Eridanus, the river, which starts near bright Rigel and meanders upwards and southwards to where its brightest star, Achernar, points to the small Magellanic cloud. Continuing on to the zenith we find the faint constellations Sculptor and Phoenix. Due west, bright Fomalhaut, alpha star of Piscis Austrinus is 5 hand-spans below the Zenith (and 12 hand-spans above the western horizon). Three hand-spans to the left of Fomalhaut is Grus, the crane, with a distinctive, battered cross-like shape. About five hand-spans down from Fomalhaut is the battered triangle of Capricornius, the Water Goat, currently hosting Uranus and Neptune. Of interest as well is alpha Capricornii, (eight hand-spans below Fomalhaut and 4 hand-spans from the horizon) the brightish star at bottom left hand corner of the triangle that is Capricorn. This is a naked eye double star. Returning to the Zenith and working towards the northern horizon; five hand spans below the zenith (and 12 hand-spans from the northern horizon) is Cetus, the whale, which stretches down and right. Beta Ceti is a modestly bright star 4 hand-spans below and a hand-span left of the zenith, the rest of Cetus is relatively faint. Mira, Omicron Ceti (O on the maps) is a variable star with a period of about 332 days. Mira is currently around magnitude 5.0 and is start brightening for a maximum in late December. Cetus also hosts a nearby sun like star. Tau Ceti is 11.4 light years away from earth, looking 12 hand-spans up from east and three to the left is magnitude 2 Deneb Kaitos, beta Ceti. Two hand-spans below and slightly to the left is eta Ceti, two hand-spans to the right of eta Ceti, forming a triangle with eta and beta, is Tau Ceti. Three hand-spans below Cetus is Pisces, a rather nondescript constellation, despite its importance in the Zodiac. Continuing down Mirach (beta Andromedae) is 14 hand-spans from the zenith, and three hand-spans from the northern horizon. One hand-span below and half a hand-span to the left of Mirach is the Andromeda galaxy (also 1 hand-span to the left of due north and two above the horizon), one of the local group of galaxies and very similar to our own, at magnitude 3.2 it should be easily visible to the naked eye under dark skies as a fuzzy star. The binocular view should be excellent. A hand-span to the right and a hand-span up from Mirach is M33, the pinwheel galaxy, also a member of the local group. At magnitude 5.7 and relatively close to the horizon, this galaxy is a challenge to see with the naked eye, but is easily found in small binoculars. To the left of Mirach by two hand-spans, and up by one is Alpheratz, (alpha Andromedae) the bottom right hand star of the "great square" of the constellation Pegasus, the winged horse. The stars that make distinctive box shape of the main constellation lies around three hand-spans to the left of and up from (and 4 across from) Alpheratz. Now return to the zenith and go South. Directly south by four hand-spans and slightly to the left is Achernar, alpha Eridanus. Directly south again by about three hand-spans is the Small Magellanic cloud, the second largest of the dwarf satellite galaxies to the Milky Way. This feature is best viewed on a dark night, away from the city. In this nebulosity is what looks to be a fuzzy star, this is 47 Tucana (marked 104 on the map), a spectacular globular cluster that is very nice through binoculars. To the right of the Small Magellanic Cloud by about 4 hand-spans is the dim constellation of Tucana, the Toucan, the parent constellation of 47 Tucana. A hand-span further down and three to the left is the extended nebulosity of the Large Magellanic cloud, the largest of the dwarf satellite galaxies. Binoculars will reveal a rather attractive nebula near it, the Tarantula nebula. Continuing directly down from the Magellanic cloud by about 3 hand-spans (about 6 from Achernar) and about one hand-span right is Octans, the octant (a navigating instrument the was the forerunner of the sextant). Octans houses the south celestial pole, and the faint Sigma Octanis, the South Polar star, which is the southern equivalent of Polaris. At magnitude 5.5 you will be stretched to see it under city conditions, but it is six hand-spans below and slightly to the left of Achernar, forming the right angle of a triangle with two other faint stars (tau and chi Octanis). Slightly below and to the right of Octans by around one hand-span is the faint Chameleon, a narrow "kite" of four stars with the long axis nearly parallel to the horizon. Moving down by another two hand-spans is Musca, the fly, and to the right of that by around three hand-spans is Triangulum. Directly below triangulum are the bright, distinctive alpha and beta Centauri, the so called "pointers", two hand-spans from the southern horizon, with alpha being the yellow star which is furthest from the horizon, and beta the blue white star below and to the left. Most of the rest of Centarus, the Centaur, is too close to, or below, the Horizon to be seen properly. Alpha Centauri is the closest star to our sun at around 4 light years. However, recent measurements with the Hippacaros satellite put the system 300 million kilometres further away than previously thought. Alpha Centauri is actually a triple star, consisting of two sun-like stars and a red dwarf, Proxima Centauri, which is the closest of the triple stars to earth. Returning to alpha Centauri, following a line south through the "pointers" brings you to the Southern Cross, one and a half hand-spans from beta Centauri to beta Crucis, and one hand-span above the horizon between the 6 o'clock and 7 o'clock position on a clock. A high definition map of Centaurus and Crux is here. The Southern Cross is, as expected, a cross shaped formation with Acrux (alpha Crucis) and gamma Crucis forming the long axis of the cross (pointing down to the south-west, with bright Acrux on the end of the axis away from the horizon). Beta and delta Crucis, now nearly horizontal, form the cross piece of the cross. Just to the right Acrux is the coal sack. This dark area against the glow of the Milky Way represents a large dust cloud and is usually clearly visible in dark skies, but will be hard to see this close to the horizon. The Jewel box in the Cross is a small open cluster just above Beta Crucis. It is quite beautiful, but requires strong binoculars or a small telescope to see properly, and is unlikely to be good viewing this close to the horizon. Rising above the south-eastern horizon, to the left of due south is Carina (the keel of the former constellation Argo Navis). A high definition map of this region is here. It is now far enough from the horizon to appreciate its many faint objects. Looking almost anywhere in the area of Carina will reveal an interesting cluster or star formation. However, the area between the Southern Cross and the false cross (which is just above the south-eastern horizon), is particularly rich. Here you will find the "Southern Pleiades" surrounding the tail star (Theta Carina) of a prominent kite shaped group of stars, with theta Carina one hand-span up, and two hand-spans to the left of Acrux. Smaller and less spectacular than their northern counterparts, they still look very nice in binoculars. Four finger-widths below the Southern Pleiades are two rich open clusters, and the barely visible star Eta Carina. Eta Carina's spectacular nebula is only dimly seen in binoculars. Five hand-spans to the left of the Southern Cross is the False Cross, three hand-spans from the southern horizon. Just to the left of the False Cross is a good open cluster, normally just visible to the naked eye but hard to see this close to the horizon. Still very nice in binoculars though. Canopus (alpha Carina) is a bright yellowish star sitting seven hand-spans above the south-eastern horizon (and about 4 hand-spans along and up from the False Cross. Vela and Puppis (to the left and below Carina respectively) are also beginning to clear the horizon, and in the coming weeks their collection of clusters will be more apparent. The maps look a little busy, as they cover all sky from horizon to zenith. The grid lines are navigational helpers; each horizontal or vertical line covers 30 degrees of arc (the gridlines in the illustration show 15 degrees of arc), which is roughly five hand-spans (where a hand-span is the width of your hand, held flat light a "stop" sign at arms length). As you can see from the way the lines bunch up. The map is a little distorted, due to trying to project a spherical surface on a flat surface. The horizon is the lowest curved line on the map (for technical software reasons I can't block things out below the Horizon). Constellations are linked by lines and their names are in italics. Stars are shown as circles of varying size, the bigger the circle the brighter the star. The stars are named with their Bayer letter (eg a - alpha, the brightest star in a constellation, a Crucis is the brightest star in Crux). Variable stars are shown as hollow circles, double stars are marked with a line (eg a, b and g Crucis are all double stars, that look quite beautiful in a small telescope). Clusters and Nebula brighter than magnitude 6.0 are marked as broken circles (eg. the Jewel box cluster next to b Crucis above which is best viewed in binoculars or a telescope) and squares respectively. To find Crux for example, locate Crux on the appropriate map (eg. see the illustration above). Holding the Map, face either east or west (depending on the map), then use the grid lines to determine how far over and up you should look, then look for the Crux pattern in that part of the Sky. 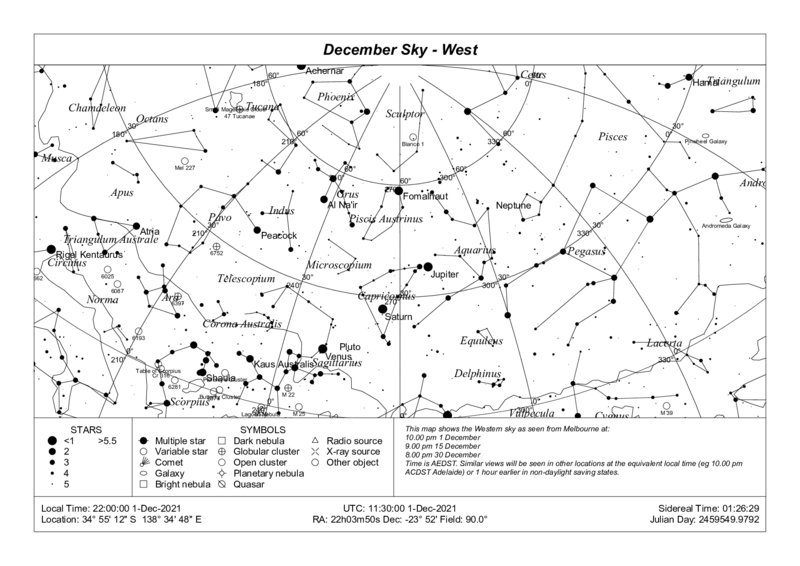 A view of the Eastern December sky at 10.00pm AEST on 1 December can be downloaded here (decsky_e.png 30 Kb) and a view of the western December sky can be downloaded here (decsky_w.png 30 Kb). These are more compact files but don't have a lot of resolution. High Resolution PDF files can be obtained for the eastern (110 Kb) and the western (110 Kb) horizon maps. The Zenith Map (110 Kb) shows you the whole sky. You will need to face the one of the compass points, then hold the map with the appropriate compass point on the map at the bottom of the page. You will need a PDF viewer such as Adobe Acrobat or GhostView to view and print them. They look slightly worse on-screen than the PNG files, but print much better and come with legends. Cheers! And good star gazing! Some of the photographs/images I have taken in recent years of astronomical phenomena that may be of interest. OnLine Astronomical Societies in Australia, from the Astronomical Society of New South Wales Inc. Monthly free Star maps. 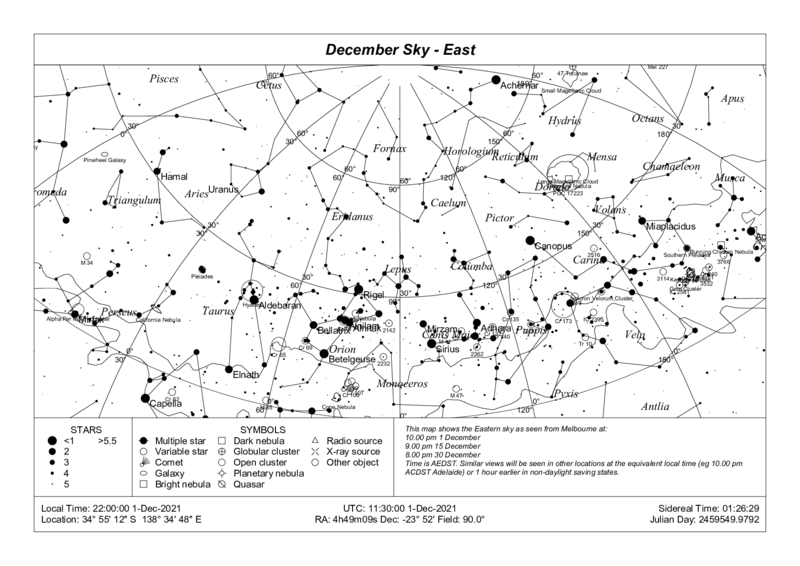 High quality, monthly maps for Southern and Northern Skies, has lists of interesting objects. Requires Adobe Acrobat to print. Peter Enzerinks Astronomy page - Web based telescope/eyepiece calculator and other southern sky tidbits. Buying a telescope in Australia, lots of helpful hints. Spaceguard Australia the proposed search for Near Earth Objects including meteroids. Sky and Space, Australia's Astronomy magazine. Planetary Society, Australian Volunteers events diary. ABC Space for Kids, Games, information and more. Star Child NASA space information for kis 5-13. Astronomy for Kids (different site to the one above, and a bit simple, but lots of good images). A 3D map of satellites orbiting the Earth in real time! Simply amazing! The Anglo Australian Observatories 3D virtual tour through a 3D map of the Cosmos. Mind Blowing! Views of extrasolar planets seen from the Southern sky, stunning Java-driven map with heaps of (complex) info. 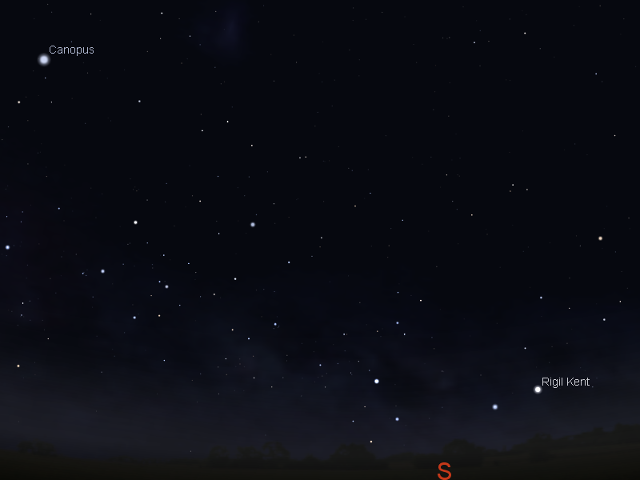 Stellarium, free (but large) photorealistic sky charting software. What I use for the horizon views. Celestia, free 3D space travel software, see the Earth from Mars, see the Moon of EL62, see Saturn rise on Titan. Script to show Conjunctions of Earth from Mars. Definition File for asteroid 87 Sylvia and her two moons (see story here). Definition File for Pluto's two new Moons P1 and P2. Definition file for three Neptunian extrasolar planets of HD 69830. Asteroid 2004 VD17, which will not hit the Earth. Definition file for for the Gliese 581 system that contains the most Earth-like world yet. If you would like to have charts available all the time, rather than relying on mine, for between $2-$20 you can pick up a planisphere from a newsagent or bookshop (or for a bit more you can get fancy ones from Australian Geographic, the ABC shop or the other Australian Geographic look alike shop, or the Wilderness Society, or even a binocular/ optical store). The planisphere won't give you position of the planets, so you will need to get the planet rise/set times. These can be found in most serious newspapers (the Age, the Australian, SMH etc. The Australian is probably the best bet for budding amateurs). The combination of planisphere and rise/set times is the best value for beginners though, if you are not too worried about identifying star clusters in your binoculars. Touring the Universe through Binoculars Atlas is now freeware http://www.philharrington.net/tuba.htm it can print observing charts, but has a few annoying quirks. These include having no horizon line, and moving about is a bit irritating. I use a combination of a 1962 star chart, the Australian Astronomy 2018 almanac and SkyMap Pro 11.0 . I highly recommend the Australian Astronomy 2018 almanac. It is more helpful for planetary/comet/asteroidal observations and eclipses than for double stars, clusters galaxies etc, but is an excellent resource for Australian observers and anyone who would like to seriously follow the planets in Australia should have this almanac. It has easy to follow month-by-month summary information, as well as detailed charts, tables and whole sky maps. It is easily navigated. The Almanac is often in big bookstores or optical shops, or email info@quasarastronomy.com.au to purchase a copy directly for those outside major population centres. The Australian Astronomy almanac comes out in around November for the following year, and is now approx $30. Sky and Telescope now also do an Australian version of their magazine. For detailed chart drawing and timing of events, as well as satellite track predictions I feed the information from the almanac into the $150 AUD SkyMap Pro 11.0 , planetarium program. This is a very handy program which prints maps of every possible orientation and scale. The maps on this page are produced by SkyMap. An update to SkyMap 12.0 which handles Windows 10 is now available. A shareware version of SkyMap that runs on windows 3.x, and win95 can be found here http://www.winsite.com/info/pc/win3/desktop/skymp21a.zip this is approximately 640 Kb zipped. Cartes du Ciel at http://www.stargazing.net/astropc/ (FREE) a bit messy to install but very good. Stellarium at http://stellarium.sourceforge.net/ (FREE) stunning photorealistic program, but requires a grunty PC. Stary Night various versions from $49 US for the basic pack (10 day trial of the basic pack at http://www.siennasoft.com/english/downloads.shtml) up. On the other hand a standard Sky Atlas for serious observing (much handier than carting a computer with you) such as Norton's Star Atlas can range from $35 to $90. In these days of hand-held devices (smart phones and tablets), there is a plethora of sky charting apps you can take into the field with you. I use GoogleSky for android and a cut down version of Stellarium for iPad, my most used hand-held app is Heavens Above for Android, for watching Iridium flares and ISS passes. This is one app that has changed my astronomical life. There are many more, many free or less than 1 AUD to download. Celestron has a great free planetarium app (although big at 154 Mb) for Android, iPhone and iPad, SkyPortal. This is not meant to be a product endorsement of any kind (outside of the Australian Astronomy 2018 almanac. For any budding astronomers out there, it is fantastic value and no, I don't have any commercial interest in it, but I did win bronze in their website Olympics). This page is provided by Ian Musgrave and is © copyright 2018 Ian Musgrave, except the "Southern Sky Watch" logo, as well as any other ABC logo used on this page, is © copyright of the ABC. Sky maps are generated with SkyMap Pro 11.0 . This page can be used freely for any non-commercial purpose but please attribute it correctly. However, see the disclaimer.